This week we had fun searching the Halloween trinkets at the dollar store. 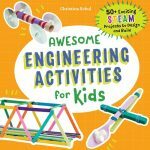 Some of the items will be used for goodie bags for a kids Halloween party. The rest were perfect for a quick and easy Halloween sensory bin. Whether you have toddlers or kindergartners, a sensory bin is a fun way for them to explore and even calm themselves after a long day. 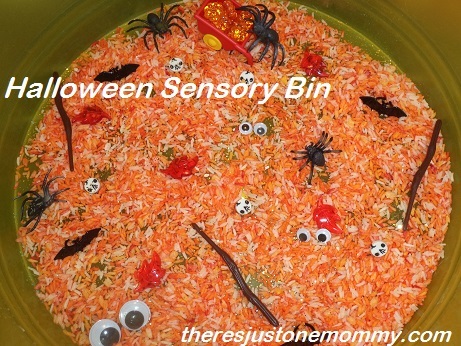 To make our sensory bin I reused our orange rice from our earlier super easy fall sensory bin. You could easily use plain white rice or another filler like dry beans. Then I added wiggly eyes, some “witch broom sticks,” bat rings, Halloween mini erasers, toy spiders, and some colored plastic fall table scatter. Both my kindergartner and preschooler loved the bin. 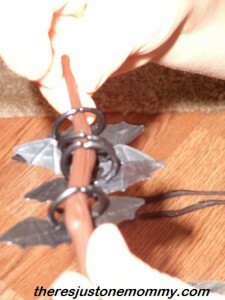 The preschooler lined up the bat rings on a stick and was delighted that they all hung upside down like real bats. While he told a story about a happy bat family, his sister made a stew. She found a plastic bowl and spoon and proceeded to dish up delicious bowls of witch’s stew. Want a bowl? That’s when I remembered the battery tea lights I had meant to put in the bin. They loved this new addition and spent quite a while checking out what each item looked like in the light and pretending to cook the witch’s stew over candle light. Once they were finished playing, I decided to try something new. Instead of putting it all away, I poured some of the rainbow rice into a pencil pouch. Then I added in a few of the skull erasers, googly eyes, table scatter, etc. 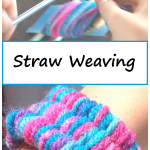 to make our own Seek and Find pouch. I just put a piece of clear packing tape across the zipper of the pouch, but for a younger child I would sew the zipper pull so you can’t just dump it. 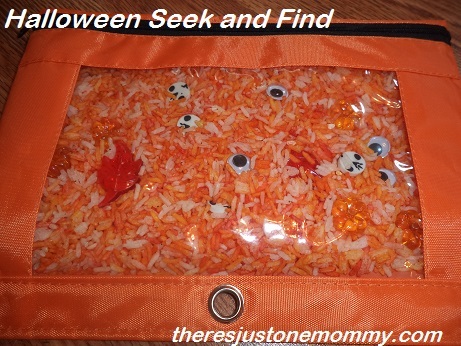 The kids have been enjoying the Halloween Seek and Find pouch and the Halloween Sensory Bin all week. Apple-Scented Bubble Dough — You won’t believe how silky this easy to make playdough is. 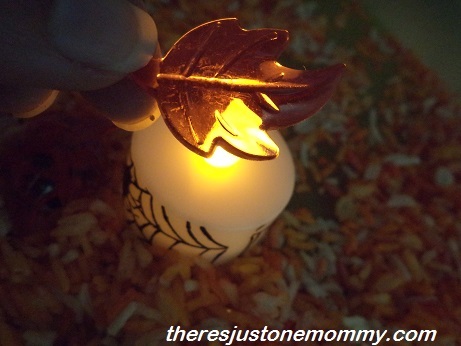 3 Preschool Halloween Crafts — Skip the scary and try these cute crafts with your kids. 30+ Kids Halloween Party Ideas — From DIY decorations to cute snacks and games, everything you need to host a party they’ll remember. Really cute. Sealing the case was a wise idea. I can just picture the rice and other things scattered everywhere. LOL — Yes, me too! Mostly I pictured it all over the car…. 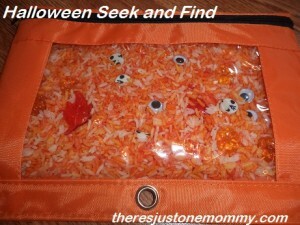 I love that you turned it into a sensory bag at the end! We usually end up just storing things forever 🙁 We’ll have to try to sensory bag idea! 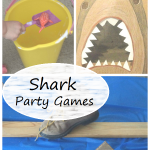 Thanks for linking up at the Sensory Play Party! I usually wind up just picking it all up afterwards, too. But I had these pencil bags and just thought we’d give it a try. The bin looks great and the find and seek pouch is fun too! I like the orange rice too! 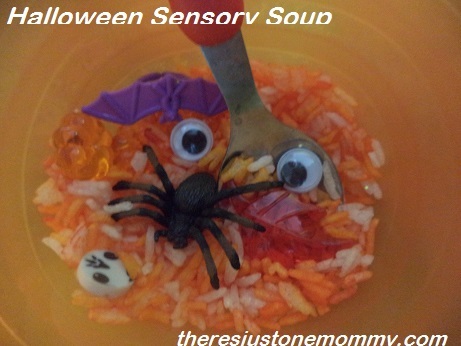 Pinned to our Facebook Share Day board and our Sensory board! 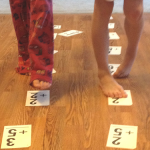 We love being able to take our sensory bins and turn them into seek and finds.